January 24, 2019 (Washington, D.C.) - Congresswoman Susan Davis (D-San Diego), a senior member of the House Armed Services Committee, has been appointed to serve on the Military Personnel Subcommittee and the Strategic Forces Subcommittee. Davis returns to Military Personnel as a member. She was Chair of Personnel from 2007 to 2011 and served as Ranking Member from 2011 to 2017. Davis will be the second highest ranking Democrat on the Armed Services Committee. November 6, 2028 (San Diego)-- Voters warmed to environmental attorney Mike Levin as early state results show the Democrat wresting the coastal 49th Congressional District from longtime GOP control. 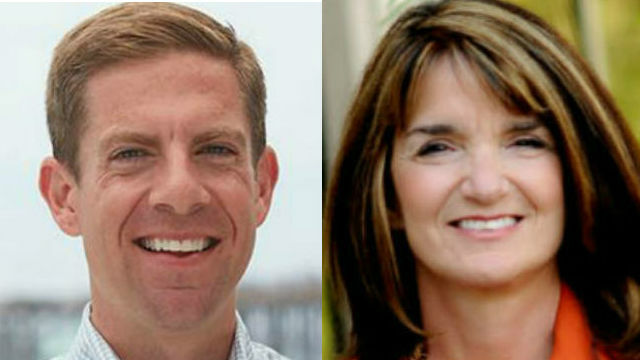 The state’s overall tally showed voters in southern Orange County and northern San Diego County favoring Levin over state Board of Equalization member Diane Harkey, a Republican endorsed by retiring Rep. Darrell Issa, 53 percent to 47 percent. Photos: Pittsburgh memorial to slain synagogue victims, White House flag at half mast, Eifel Tower in Paris dark in commemoration, Pittsburgh Steelers logo with star of David. November 1, 2018 (San Diego) – Around the world and locally, the world grieves the slaughter of 11 Jewish people during a worship service and baby-naming ceremony at the Tree of Life Synagogue in Pittsburgh, Pennsylvania this week. Congressman Duncan D. Hunter (R-Alpine) has been silent on the issue on his social media. His opponent, Ammar Campa-Najjar, issued this statement: “I am horrified by the heinous attack,” adding, “There are no words to fully convey our sadness and horror at the murder of Jewish people who were worshipping with their community on Shabbat." Photo: Congressman Juan Vargas, right, and Congresswoman Susan Davis, left, arrive at child detention facility in El Cajon. June 18, 2018 (El Cajon, CA) – San Diego Congressional members Susan Davis and Juan Vargas joined House Minority Leader Nancy Pelosi and other Democratic members of the Hispanic Caucus in touring three local facilities holding child immigrants, including a fenced facility in EL Cajon with 65 migrant boys, 10 percent of whom were forcibly separated from their parents by the Trump administration’s new “zero tolerance” policy of prosecuting all undocumented parents. In the past six weeks, the federal government has acknowledged taking away over 2,000 children from parents at the border, including infants and toddlers. April 26, 2018 (San Diego’s East County) -- The House today passed an amendment authored by Congresswoman Susan Davis (D-San Diego) to protect emergency responders from illegal drone use during disasters. Davis’s amendment directs the federal government to work with state and local entities to educate the public about the dangers of flying unmanned aircraft into areas with temporary flight restrictions. It also calls for coordinating on enforcing current laws against such drone use. The bill has yet to pass the House. February 22, 2018 (San Diego’s East County) – Last month, Congresswoman Susan Davis volunteered to participate in the annual “We All County” homeless survey in East County. In this photo, she is shown listening to Jesse, a homeless man who told his story to his representative. July 27, 2017 (San Diego) – President Donald Trump’s tweets yesterday stating that he is reinstating a ban on transgender people in the U.S. military do not have the force of law. Now, the Chairman of the Joint Chief’s of Staff says the military won’t take action until Trump sends directives to the Pentagon. In addition, San Diego Congressman Scott Peters has proposed an amendment to a major defense appropriations bill that would block discrimination against transgender people in the military--and even many staunch conservatives are voicing support for transgender troops. July 27, 2017 (La Mesa) –A high-powered panel of local political heavy-weights will discuss what inspired them to run and why others should consider entering the political arena at the Wednesday August 2 meeting of La Mesa Foothills Democratic Club (7 p.m. in the La Mesa Community Center (4975 Memorial Dr, La Mesa). Democrats outnumber Republicans in La Mesa, Lemon Grove and San Diego, yet there are scores of seats on local boards and jurisdictions where Republicans run unopposed every election cycle. Now, Democrats are taking their “Resist Trump” agenda to the grass-roots by enticing new leaders to run for office.and inspiring those on the sidelines to get involved. June 17, 2017 (San Diego) – “I understand how concerned all of you are by the challenges facing our country, and so I look forward to another opportunity to hear from you,” says Congresswoman Susan Davis (D-San Diego), who will hold her next town hall meeting on Monday, June 19th from 6 p.m. to 7:30 p.m. at San Diego State University’s Conrad Prebys Aztec Student Union (6075 Aztec Circle Drive, San Diego). Her district encompasses San Diego and parts of East County including La Mesa, Spring Valley and parts of El Cajon. April 7, 2017 (Washington, D.C.) - As President Trump calls for dramatic cuts to life-saving medical research, Congresswoman Susan Davis (CA-53) led a bipartisan group of House members in an effort to increase the budget for the National Institutes of Health (NIH). Davis’s letter to House appropriators urges $36 billion for medical research and was signed by 206 members of the House. Trump is proposing a nearly 20 percent cut in NIH funding. April 1, 2017 (El Cajon )—Congressional members Duncan Hunter and Susan Davis held a press conference today in El Cajon to unveil a new “replicator” technology to be headquartered near Gillespie Field. March 12, 2017 (San Diego) -- Concerns over healthcare reforms, deportations, attacks on public education, troops in Syria, climate change, and Trump’s Russian ties were among the issues raised by constituents of Congresswoman Susan Davis (D-San Diego) at a town hall forum yesterday. More than 1,000 people filled Montezuma Hall at San Diego State University to capacity. February 23, 2017 (San Diego) – Congresswoman Susan Davis (D-San Diego) invites constituents to attend a town hall meeting Saturday, March 11 from 10 a.m. to 11:30 a.m. at Montezuma Hall at San Diego State University (in the Conrad Prebys Aztec Student Union) at 6075 Aztec Circle Drive, San Diego. February 2, 2017 (Washington D.C.) -- Congresswoman Susan Davis (D-San Diego), a senior member of the House Committee on Education and the Workforce, was named as the Ranking Democrat on the Subcommittee on Higher Education and Workforce Training, which plays a key role in shaping higher education policy. January 31, 2017 (San Diego) -- “Federal courts have rightly stayed President Trump's unconstitutional executive order banning Muslims and refugees. Immigration officials need to follow and respect the rule of the federal judges and allow those being held to have access to attorneys. The right of habeas corpus is a bedrock of our democracy,” says Congresswoman Susan Davis, who yesterday called on President Trump to left his executive order banning travel to the U.S. from predominantly Muslim nations. January 13, 2017 (Washington D.C.) – In the dead of the night while most Americans were sleeping, the Senate voted 51-48 to repeal the Affordable Care Act (Obamacare) even though no replacement plan has been introduced. That leaves 300,000 people in San Diego County poised to lose their healthcare. More than 900,000 others receive health care through Medi-Cal, many of whom became eligible through the ACA and could be left with no coverage potentially as soon as later this month, when President-Elect Donald Trump takes office, if he signs a repeal into law. The measure still needs approval by the House, but with overwhelming support by Republicans in control, it’s expected to sail through. Even many Republicans are raising doubts over whether any replacement plan could be enacted in time to prevent loss of coverage, how much coverage would cost, or whether some would be left uncovered by a future GOP plan. January 7, 2017 (San Diego’s East County) -- Rep. Susan Davis on Friday called for a “truly bipartisan and independent” probe into Russian hacking during the Presidential election. June 23, 2016 (San Diego) –Although more than 60% of Americans support limits on access to assault weapons, Republicans in the House and Senate refused to allow votes on such measures. In the Senate last week, Democrats filibustered to force a vote, but the Republican majority defeated a measure authored by California Senator Dianne Feinstein. Last night, House Democrats staged a sit-in seeking to prevent the House from adjourning without taking up a similar measure. Republican House Speaker Paul Ryan shut off cameras to prevent TV coverage on C-Span, so San Diego Democrat Scott Peters live-streamed the action on his cell phone with a Periscope app. Democratic Congresswoman Susan Davis, whose district includes San Diego and East County cmmunities, also spoke—and sat—on the House floor. April 24, 2016 (Washington D.C.) -- Congresswoman Susan Davis (D-San Diego), Ranking Member of Subcommittee on Military Personnel, included a number of policy provisions to increase benefits available to our men and women in uniform. The Subcommittee approved its portion of the working draft of the National Defense Authorization Act. March 9, 2016 (San Diego) -- During a roundtable discussion at the Copley-Price Family YMCA, Congresswoman Susan Davis (CA-53) and Congressman John Sarbanes (D-MD) unveiled the Government By the People Act (H.R 20), a bold new reform that would help everyday people in San Diego and across the country fight back against wealthy and well-connected special interests. February 11, 2016 (San Diego) -- In response to the crisis in Flint, Michigan, the House of Representatives voted to require water system officials to alert their customers if the EPA notifies them of increasing level of lead. The Safe Drinking Water Act Improved Compliance Awareness Act (H.R. 4470) passed the House on a strong bipartisan vote of 416-2 with all five of San Diego’s Congressional members voting for the bill.